The movie poster and trailer for Me Before You have finally been released and I am super excited! 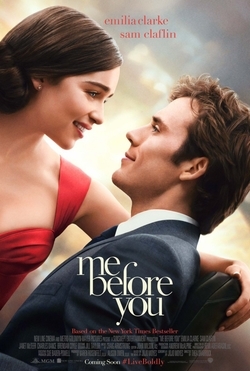 Me Before You is a movie based on the 2012 novel written by Jojo Moyes. The film will star Emilia Clarke (Game of Thrones), Sam Claflin (The Hunger Games), Matthew Lewis (Harry Potter), Jenna Coleman and Charles Dance. Will Traynor used to enjoy life to the fullest, until an accident made him a quadriplegic and took away his desire to live. Lou Clark just lost her job and is forced to take a new job: taking care of Will. This arrangement will eventually change both their lives forever. This was the first book I read this year and I absolutely loved it. (See my review here) It was a beautiful story and from what we can see in the trailer I think the movie will do it every bit of justice it deserves! Emilia and Sam look absolutely perfect as Lou and Will and the scenes we see in the trailer look just as I pictured them while reading the book. Now we only have to wait some more until June 3rd!